The German started the second round of training and finished with the same result despite the pressure from Luthi and Álex Márquez. Marcel Schrotter (Kalex) resistió all attacks to be the fastest of Moto2, at the end of the first day of practice of the GP of the Americas. The German started as the leader the second and final round of free practice and finished the same with the same result, although during the forty minutes of the session he had to do with the Swiss Thomas Luthi (Kalex) or the Spanish Alex Márquez (Estrella Galicia 0'0 Kalex), who sought to evict him from the first place without success. A the regularity of Marcel Schrotter in the first position was added the remarkable improvement of the Italian Lorenzo Baldasarri (Kalex), winner of the first two races of the season, Qatar and Argentina, which went from the fourteenth place in the first round of tests to the sixth in the second. Like Schrotter, were awarded to the regularity both the Swiss Thomas Luthi, always there, after the German, as the Spanish Alex Márquez, at all times among the fastest of the category, although in the end the German driver achieved an advantage of half a second with respect to the most immediate of his pursuers, a remarkable advantage but that in the circuit of the Americas, it does not seem irretrievable for his rivals. 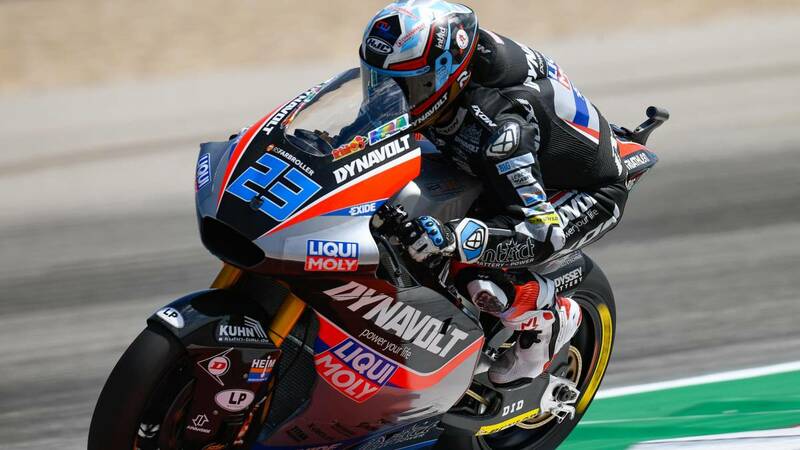 Antre the outstanding notes of the session, although not positive, was the fall of the Spanish Xavier Vierge ( Estrella Galicia 0'0 Kalex), who damaged his motorcycle enough and therefore could barely make four laps of the track, being relegated to a more than discrete eighteenth place. In the case of the South African Brad Binder (KTM), the mishap was in the form of a mechanical problem, which took him away from the head of the category and, ultimately, relegated him to the fifteenth position, just ahead of Iker Lecuona (KTM). ). Jorge Navarro (Speed Up), third in the morning, moved away from those positions to finish ninth, behind the Italian Mattia Pasini (Kalex) and ahead of the Australian Remy Gardner (Kalex). Jorge Martín (KTM), world champion of Moto3 in 2018 won some positions, four, to go from the twenty-fourth to the twentieth at the end of the day.